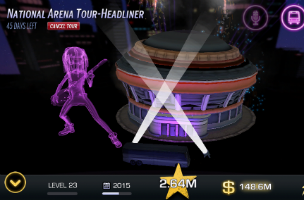 If you’ve ever wondered what it’s like to live the life of a struggling musician working their way to fame and fortune, you can now virtually experience that life in TourStar on iOS. The new mobile game was created by Brandon Pankey of Music Players Group and Eddie Meehan of GroundCtrl, and offers a music career simulation experience that focuses on realistic struggles and decisions, as well as the perks of being a musician. When launching their music career, players create an avatar and a set “sound” (like pop) for their music. Gamers have very little money, and have only their mother as their manager. How will they make it to the top? To start, players can take gigs at very small venues, including high school dances and birthday parties, earning a few fans and some extra spending money along the way. While performing a gig may sound glamorous, players have to take their character’s energy into account. For instance, spending energy on tuning up equipment may increase the quality of the performance, but it limits the band’s ability to complete additional actions without waiting. These actions, like warming up or tuning equipment before a show, are accomplished via reflex-focused mini-games. Players also need to account for the daily expenses necessary to travel around to these gigs, and random occurrences which may see band members miss shows entirely. Outside of performing, users can spend some time recording singles and albums to earn extra money. This brings in additional options, as players can decide whether to sign with a major record label (which takes some of the proceeds) or stay independent. The more popular players become, the more crew members they can hire for their entourage. Players can fire their moms and hire full-time managers, agents and publicists, as well as new band members. Users can also purchase new touring vehicles for energy regeneration bonuses, but these vehicles cost money to maintain. Every action has an impact on the player’s career going forward, and not all of these changes are necessarily positive. As gamers continue to play TourStar, they’ll unlock the ability to win real-world prizes, including concert tickets, VIP meet-and-greet opportunities with popular artists, clothing and free downloads of ringtones and other content. TourStar is available to download and play for free on iOS. However, once players hit Level 5 of their music career, they’ll need to pay $0.99 to unlock the full game.